To make things easier for the GM, we have placed all members of Southern Hill Sect and Twin-Fisted Eagle Clan into their own sections (we also repeat their stat blocks in their sect entries in the gazetteer section). Following this, we do the same for other minor sects in the area. Individual masters and NPCs are then presented. We do this because in practice we find it much easier to have all sect members stats close together. For longer entries, I add in a background section, to make them easier to navigate. Some key sources of inspiration were The Fate of Lee Khan, Shaolin Mantis, Avenging Eagle, Sword Master and Killer Clans. Yellow Mantis is a stern and righteous man in his 70s. Despite his age, he is in peak physical condition and has devoted his entire life to abiding by strict Dehuan principles. He believes in destroying all wicked practitioners of Kung Fu and goes to great lengths towards this goal. He has many children and grandchildren, but has sent them to stay with an uncle in Xuanlu until the war with Twin-Fisted Eagle is over. He always wears a bright yellow robe. This is a bold statement as only the King is permitted to wear yellow, but Yellow Mantis regards himself as the most righteous and most worthy to wear the color. Neither the king nor the queen have dared object. Though trighteous and bold, he isn’t stupid and uses good tactics. Yellow Mantis has one weakness that can cloud his judgment: a fondness for music. His musical talents are small and he greatly respects musical ability in others. Background: When he was younger, Yellow Mantis was a student with a new family traveling to Xuanlu to take the exams. They were attacked by the Lu Hai bandits who killed his wife, children and left him for dead. Yellow Mantis lay dying in the grass when a praying mantis appeared on a single blade before him. He studied its movements and realized he could imitate them to counter the moves of the men who had harmed him. He trained for two months in the fields and used his new-found skills to slaughter the Lu Hai bandits. He attained the title Jinshi and served the court but retired to his villa in the southern hills and resumed his martial arts training because he found court politics distasteful. There he had all his servants gather mantis from every corner of Qi Xien and bring them to his garden, where he continued to develop and train. Eventually he took students and married a woman named White Chrysanthemum. The Righteous Staff of the Mantis: Yellow Mantis’ Staff (see below) allows him to see the crimes and misdeeds of anyone who stands before him. White Chrysanthemum is the wife of Yellow Mantis and in her 60s. She shares her husband’s sentiments regarding Dehuan virtues and believes the martial world is filled with too much corruption. She is sterner than him on most points and feels he spoils his grandchildren too much. She expects all members of her household to meet high expectations. White Chrysanthemum is on friendly terms with Timeless Perennial and the Perennial World Sect. However, she also has concerns about Timeless Perennial’s power or techniques being corrupted. Therefore, she devised a technique called Array of the Moonflower and sealed it in Moonflower Cave so that in the event of her own death, it will be available to heroes in need of it. It is a counter to Timeless Perennial’s Blazing Rays of the Sun Technique. Background: White Chrysanthemum was originally a disciple of the Golden Dragons but left after their moral decay became clear. She formally cut all ties with the sect and studied under various masters throughout the Banyan, always being more concerned with their virtue than their skills, and never formally joining any sect. Among her teachers are the leaders of Heiping and Dehua Sect. Yellow Mantis’ chief informer and spy, Gentle Blade is a wandering swordsman with a stubborn streak and independent spirit. He cares for two things: swordplay and the truth. While he is devoted to swordplay he is reluctant to fight unless it is necessary, so both his friends and enemies call him Gentle Blade. No one but Yellow Mantis knows he is part of Southern Hill Sect. To all outside observers, Gentle Blade is an eccentric wanderer who dresses in black and carries a sword over his back. Background: Gentle Blade was once Yellow Mantis’ enemy. They feuded with each other for weeks when Yellow Mantis believed false rumors and accused Gentle Blade of robbing local villagers. When evidence was presented that this was a lie, Yellow Mantis dropped to his knees and told Gentle Blade he could chop off his tongue for speaking falsely about him. In this moment, Gentle Blade realized that they were both men who valued truth, even if their methods differed. They became sworn brothers and Gentle Blade vowed to secretly serve Yellow Mantis as his intelligence chief, so he would never be mislead again. Green Mantis is a man in his late forties with gray hair and a small beard. He wears green frequently and enjoys tea. Green Mantis cannot stand hypocrisy and is especially intolerant of unfilial acts. However, he is more inclined to maim than kill foes. Green Mantis has an affinity for nature and understands the animal world. He is Yellow Mantis’ chief animal and insect handler and is friendly with the monkeys along the River of Swarming Beggars. Many of them regard him as a kind of Sifu. While they have hardly mastered Kung Fu, many have taken to imitating him and he makes regular visits to his monkey friends. Red Killer of Hu Qin is the brother of Yellow Mantis and was once a member of the sect, when he used to go by the name Red Mantis. He isn’t present in Hai’an, but if Yellow Mantis is killed, he will seek revenge. He dresses all in red. Red Killer of Hu Qin was simply too defiant and violent for Southern Hill Sect, so he was forced out ten years ago. Presently, he resides in Hu Qin, where he leads a small group of thugs who form a protection racket for local businesses. The Red Killer of Hu Qin has a son living in Dee, but does not know about him (he was never told). Twin-Fisted Eagle is a schemer whose loyalty and honor only extend to his clan or anyone he takes as a sworn brother. He has striking features which are fearsome but neither handsome nor ugly. His manners can be crude at times and he is unusually frank about his methods as he likes to boast of his ability to outwit and outmaneuver his foes. He will even do this to people he’s deceived, expecting them to admire his schemes. For this reason, few are tricked more than once by Twin-Fisted Eagle. He understands strategies and has a knack for manipulation. But he is not a good judge of peoples’ reactions. He often misreads peoples’ responses to his actions and behaviors. Twin-Fisted Eagle is fond of his children and spoils them. He is also fond of wine, good food, and entertainment. He believes those with martial powers have every right to use them toward achieving their goals. He doesn’t care if people suffer beneath his hand, especially if those who suffer are unimportant. Twin-Fisted Eagle wants to vent his anger and extinguish Southern Hill Sect. He hopes to recruit heroes to his cause, then kill them when the war is over so he can take full credit. Ho’elen is Twin-Fisted Eagle’s adopted daughter. He found her as a baby when he slaughtered a group of Naqani merchants. Her mother seemed Kaillin or Kushen to him and her last words were “Ho’elen”, so he kept the name. However she is actually the daughter of an official from Fan Xu prefecture in the empire. Ho’elen is very loyal to Twin-Fisted Eagle and eager to destroy Southern Hill Sect. She aspires to develop her style around the spear and contribute to the growth of the clan. In order to achieve that she must find a manual or a kill a master. In the mean time she has been studying Praying Mantises in order to devise a counter to Southern Hill’s style. She developed Hidden Sting of the Scorpion to contend with their Leaping Claw of the Mantis technique, but she is not ready to use it. Ho’elen is more ambitious and intelligent than Twin-Fisted Eagle and has a grand plan for uniting the Demon Moon Clans against the King when their war with Southern Hill Sect is over. Qi Rank Increases: Because she is ambitious and determined, Ho’elen should increase 1 Qi rank each week from the start of the adventure. These changes are reflected parenthetically in her stat block. *This technique is designed to counter Leaping Claw of the Mantis, but Ho’elen is not yet high enough Qi rank to use it against anyone with that technique. She can still use it against other leaping opponents however. Tu-An is one of Twin-Fisted Eagle’s Sons. He is missing both arms and only able to use kicks in a fight. His arms were wrenched from their sockets by Green Mantis at the command of Yellow Mantis, for the crimes he committed in He Dong (See HE DONG entry in CHAPTER FOUR). He recently began training to adapt to his loss of arms. The pain of the change still impacts him and he is filled with dark thoughts. He has contemplated taking his own life several times but always hesitates. Still, this transition has caused him to reflect more on his own behavior. He is still far from perfect but is beginning to believe there is more to life than pleasure and thrashing others when his desires are thwarted. He has developed an interest in the scriptures of Sun Mai and is attempting to understand them. Note that due to his loss of limbs, Tu-On cannot use many of his best techniques. Yao Chun is the second son of Twin-Fisted Eagle. He thinks his father’s ongoing conflict with Yellow Mantis is foolish. He also believes they should try to unify the clans of the Demon Moon Lands, forming their own kingdom. He’d much prefer to drink in the nearby wine shops and venture into the cities. Jade Fist is a lifelong friend of Twin-Fisted Eagle and his sworn brother. He is perhaps the only man Twin-Fisted Eagle truly trusts. However, this trust is not well placed. Jade Fist befriended Twin-Fisted Eagle because he wanted the riches of Eagle’s Tomb. Once he gets the location of the tomb he intends to rob it. He may try to get people he can trust to help him. The Autumn Killers are a group of assassins based in Hening, lead by Mrs. Wu Dongmei, of the Autumn Inn. See HENING entry in CHAPTER FOUR for further details. Mrs. Wu Dongmei has a long scar extending from her forehead to her chin. Her age is difficult to discern and many have commented on this quality. She is owner of Autumn Inn the widow of Mr. Wu, the inn’s original proprietor. She has a sharp tongue and shrewd business sense, but also a kind heart. Secretly she is the master of a sect and all the waitresses of the inn are her disciples. They hire their services to clients Mrs. Wu deems righteous, for causes she regards as just. She has a deep and abiding hatred for Lady White Blade, who killed her husband, but does not feel ready to take her on. For information on LADY WHITE BLADE see WHOG, pages 324 and 200. The autumn killers are all students of Mrs. Wu and serve as the waitstaff of her restaurant, the Autumn Inn. Their group occasionally gets hired out for their martial talents, and this does include assassination, but they only ever accept jobs that are deemed righteous by Mrs. Wu (so they would never assassinate an innocent man or woman). This is an ancient order of Nuns who reside at the Hanging Temple of Bao on Mount Bao (See HANGING TEMPLE OF BAO on page 253 of the Wandering Heroes of Ogre Gate rulebook). They are generally peaceful, keep to themselves, and occasionally head into the river valley to find supplies or recruit new disciples (they prefer to take in young orphans). There are many rumors about this sect, some say they use Yen-Li magic to conceive and grow their order, others say they worship Gushan, and some believe they are concubines of Yao Feng himself. They encourage such beliefs. In truth, they just venerate Bao. For information on Perennial World Sect see CHAPTER FOUR. Leader of the Perennial World Sect, Timeless Perennial appears to hold a prestigious position for her age though she dresses like a commoner. She seems to be eight or nine years old, yet she displays remarkable martial prowess. She always maintains an even temperament and sunny disposition. She regards everyone she meets as being in good standing with her until they prove themselves to be otherwise. Despite this, many suspect that something is amiss about Timeless Perennial; mostly, that she is somehow disguising her true age. Their biggest claim to this is that she has been in charge of the sect for far longer than eight years. Whenever she leaves the sect, Timeless Perennial pretends to simply be a child, and brings one of her Aunties to act as her mother. This is most often Auntie Xia, but could sometimes be Auntie Qiu or Auntie Chun. It is rarely Auntie Mei. Hua Xuiying’s martial prowess is well known and she is greatly feared by the other sects. While she doesn’t meddle in local political concerns, and wouldn’t dream of intervening in the War of Swarming Beggars, both Twin-Fisted Eagle Sect and Southern Hill Sect respect her opinion and would never openly disrespect her. All women in their forties, The Four Aunties love and respect Timeless Perennial. She is not actually related by blood to any of these women, but they regard their relationship as such. They serve in part as advisors to their young Sect leader, and also to carry out business with people who wouldn’t respect the authority of someone so young. They are Martial Heroes in their own right, ready to protect their Lady and their Sect at a moment’s notice. Unlike their Sect leader, they wear dress appropriate to their station as high-ranking sect members. However, their preference of colors varies wildly. They also all bear a symbolic tattoo ordered by Timeless Perennial, which casts off their old lives and devotes them to the sect. This is in keeping with the new nicknames she assigned them. Lower members of the sect are not required to be branded in such a way. Auntie Qiu is a soft-spoken yet courageous woman. She does not retreat when faced with death, instead she confronts it silently and thoughtfully. This is her approach to many things, a somber consideration of all of her options until she arrives at the best conclusion. She is a woman of few words, and no one knows her true name. She wears mostly white clothing. She bears a tattoo of a chrysanthemum on her back, which is almost always kept covered. Auntie Chun is easily angered, and often shouts. Yet in her anger she is patient, and will carry on a livid discussion of why she believes someone is wrong for hours. She is also, however, very altruistic, set in the belief that she does everything to improve the lives of others. Her aim is to help people improve; she wishes to correct thinking. She will tell people that she used to be called Heng, but since meeting Timeless Perennial, that is no longer her name. She wears mostly green clothing, and on her back is a tattoo of an orchid. Auntie Xia is a light-hearted woman who has maintained a healthy youthful spirit. Of the Four Aunties, her personality is closest to Timeless Perennial’s, but she has gained more wisdom in her years. Due to their similarities, she is the Auntie who is most often with Timeless Perennial, as they do things like teaching disciples together, leaving official sect business largely to the other Aunties. She prefers orange clothing, and has a tattoo of a lotus on her back. Auntie Mei is a woman of low energy, and is often found sleeping during her leisure time. When awake, however, she is deadly serious, refusing to let anyone slander her name with accusations that she “naps”. She is the eldest of the Aunties, though not by much, and while Timeless Perennial explicitly made it so that the Aunties were all equal in power, the others regard Auntie Mei as the final arbiter if they cannot come to a decision. Auntie Mei’s wisdom has led her to be frugal, and she attempts to save as many resources as she can. She prefers black clothing, and carries a tattoo of a plum blossom on her back. Junior Disciples study alchemy and plants very carefully, as standing within the Sect is based on skill rather than might. They are allowed to dress how they choose; most opting for traditional Hai’anese conical hats and wrap-robes, though some who joined the Sect from afar choose attire from home, creating a somewhat disharmonious look if they are all grouped together. They uphold the first rule of the Sect beyond all else: respect nature and care for the life around them. Senior Disciples are provided clothing that indicates higher ranking within the Sect. Though they have proved to possess higher knowledge and ability than their juniors, they are still expected to continue learning and practicing the ways of the Sect. This is a secret sect led by Southern Dragon. The members all wear masks and their chiefs are important members of the martial world who have anonymously joined the organization for their own purposes. Southern Dragon seeks to grow his sect’s prestige and power. The sect is led by the two Dragons (Southern Dragon, Northern Dragon) and the two Phoenixes (Eastern Phoenix and Western Phoenix). The disciples are managed by Jagged Blade (Southern Dragon’s faithful servant) and are themselves divided into two divisions: Thundering Swords (guan dao wielders) and Lightning Archers (crossbow wielders). These are organized into squads of 3 Thundering Swords and 2 Lightning Archers each. Disciples all wear red garb with cloth masks. Leaders wear ornate dragon or phoenix masks made from porcelain. The identities of the leaders are concealed from the martial world. In reality Northern Dragon is Flower Handed Snake. Eastern Phoenix is Pale Fox. Western Phoenix is Ferocious Flower (of Tree-Dwelling Nun Sect). Their role within the group is described below and their stat blocks repeated here for convenience. Southern Dragon is the secret leader of South Wind Society. His real real name is Leng Shu and many know him as Cunning Dragon. When presenting himself as a chief of South Wind Society he wears a porcelain dragon mask painted with silver, red and black. He seeks to prove himself and grow his own prestige and power. He also wants revenge for his brother, Silent Dagger, who was killed by Thundering Guan. He wields the flaming Dao of Propriety, given to him by a being called the South Wind King. He was given the blade as a test, to see if he will make a worthy disciple. He acquired the Flaming Dao of Propriety from a being called South Wind King (a powerful god-like man rumored to be the son of the Eastern Sea Goddess and the Southern Sea Demon). He wants to be South Wind King’s disciple and was given the blade as a test. Southern Dragon is the son of Leng Shisan, a rich merchant from Zun City who has remained low-key and ensured his sons receive the best training possible. His father has purchased many stolen manuals and hired many teachers toward this end. Northern Dragon is really Flower-Handed Snake. See FLOWER HANDED SNAKE below for more details. As a member of South Wind Society, he wears a porcelain mask with dragon designs upon it, painted in gold, white and red. He joined because it gives him a chance to violate the rules of the martial world while in disguise and get away from his wife. This is really Pale Fox. See PALE FOX entry below for more information. When acting as a member of the Southern Wind Society, she wears a porcelain mask with the face of a Phoenix upon it, painted blue, white and yellow. Her mask also has many precious gems affixed to it. She joined because she admires Southern Dragon. She avoids carrying her spear when traveling with the society. This is really Ferocious Flower of Tree-Dwelling Nun Sect. See ABBESS XIONG-HUA (FEROCIOUS FLOWER) entry in WHOG, page 306. She wears a porcelain phoenix mask painted with green, white and black. She joined because Southern Dragon promised to help her get revenge against Lady Plum Blossom. She has concerns about the sect’s methods and secretive ways but also believes she can steer them toward righteous causes. Jagged Blade is a simple man who likes gold and enjoys killing when it is warranted. He is also a hard worker and loyal to a fault. He only kills those who deserve it by either being enemies of The Southern Wind Society or by hurting his pride. Jagged Blade dreams of one day rising to the level of a Dragon in his organization. Originally, he was hired by Southern Dragon as a bodyguard. At the time he underestimated Southern Dragon’s skill and thought very little of him. Now he holds him in high esteem and has vowed never underestimate anyone he meets. A’zhu is a powerful immortal worshipped as a god by the people of Dee. She never appears to her worshippers. She looks like a normal person, except her hair is bright red and her teeth are sharp and powerful. She was given the Ritual Vessel of Yao Feng by the Demon Emperor himself during the Era of the Demon Emperor. She was told about a God Killing blade found in the world the Demon Emperor came from and instructed to use the vessel to make sure no one acquires it. He sent her to the Cave’s of A’zhu which extend beneath Dee. Here the barriers between their worlds are weak, so she stands guard and requires blood to empower her abilities. She claims to be the wife of Sun Mai, but it is uncertain if this is true. *This allows her to summon and control the Red Mists of Dee. It also enbables her to uphold the barrier between realms present in the caves of A’zhu. But it requires consumption of human blood on a regular basis. **She can use any object as a weapon, doing 6d10 Damage. Brother Toad is a massive frog-like demon, standing 40-feet tall at his back. He resides in Ghostgate Cavern near the Screeching Lake. He is a servant of Emo Cheng, while his brother, Lord Frog, is a servant of the Seven Blood Cave Alliance. Brother Toad is worshipped by some of the hardy folk who live in the swamp. Brother Toad has a little bit of knowledge about everything. Not enough to be a scholar but enough to be arrogant and believe he understands the world. Nothing enrages him more than being challenged by humans. Proving him wrong, can also prove fatal. 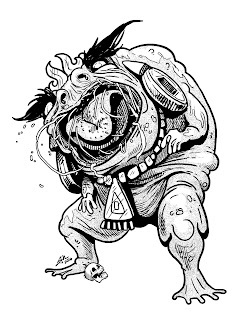 Brother Toad is always surrounded by 10 Toad Demons (see page 362 of the WANDERING HEROES OF OGRE GATE RULEBOOK) and has several human cultists in the area. Swallow: On a Successful Tongue attack all Toad Demons can swallow a person. Every round spent in a Brother Toad’s stomach does 2 Automatic wounds to the person inside. To cut through, one must do enough damage to kill him. Climbing out is possible on a successful Athletics Roll (TN 10). Exhale: Brother Toad can unleash a blast of Hot winds against everyone in a 30-foot area. Roll 3d10 against the Evade of all affected targets. On a success this does 5d10 fire damage. Ram/Squash: All Toad Demons can ram or squash people by leaping onto their bodies for 6d10 Damage. Summon Demon Toads: Brother Toad can summon 1d10 Toad Demons every ten minutes. Shape Change: All Toad Demons can take human form but always appear sick and ugly when they do so. In addition, they have their natural giant toad form, but can also change into a small toad if needed. Immunities: All Toad Demons are immune to all normal Attacks. Brother Toad only takes Damage from Kung Fu Techniques Qi level 5 or greater that involve energy Attacks (normal Kung Fu Techniques do no harm to them). Weapons that are cheaply made and rusty can do normal damage against him. Bestow Luck: All Toad Demons can bestow luck on individuals or entire communities. Brother Toad can grant a +2d10 bonus to any Skill for a given activity (for example +2d10 to Survival for harvesting rice or +2d10 to Melee Attacks against Crocodiles). Venomous Skin: The skin of all Toad Demons is poisonous and similar to Spiny Toad Venom (except it has a potency of 3d10 instead of 1d10). Touching the flesh of the Toad Demon is enough to expose people to it. But anytime a toad demon takes a wound from an attack that cuts its flesh, people in the immediate area (within five feet) are potentially exposed as the venom is released into the air. Roll 2d10 against the Evade of all within that area to see if they are exposed. Filial Cricket is a small man in his mid-40s with a boyish face. He carries a number of wooden boxes filled with crickets and is an avid wrangler of the insects for cricket fights (WHOG, page 101). Upon first meeting he is sweet and kind, almost child-like, even obsequious. He likes to flatter people and earn their trust but is deeply vindictive and kills through poisons and stealth those who wrong or even accidentally slight him. Upon meeting someone he very quickly determines if that person is a lifelong friend or one of the many passerby worthy of death should they say the wrong thing. His measure for this is how much respect they show him. Anyone he places in the first category he is sincere toward and will seek to become their sworn sibling (honoring the expectations of that relationship in every way). To such people he will be loyal to until the day he dies. Everyone else who crosses his path is a misstatement away from being poisoned or murdered in their sleep. For rules on Cricket Fights see page 101 of the WANDERING HEROES OF OGRE GATE rulebook. Poisons: Cyanide, Fire Poison, and Zhen Bird Venom. See WHOG, page 97 for poison entries. Flower Handed Widow is tall with an athletic frame. She is an adept Yen-Li practitioner and taught her husband, Flower-Handed Snake everything he knows. She loves Flower-Handed Snake, but he gets on her nerves and she lets him wander freely for a time before missing him and summoning him back to her presence. She is very much in command of the marriage and enjoys verbally sparring with him. She allows people to call her Flower-Handed Widow due to her husband’s frequent absences because she believes it makes people more sympathetic to her. However, he has been away for a great length of time and she grows bored of his absence. Flower-Handed Widow will pay 200,000 spades and teach one technique to anyone who returns him to Flower Snake Villa. Flower-Handed Snake is a handsome man in his 50s. He has a wide build and always dresses in silk robes of green, silver and gold embroidered with snakes wreathed in flowers. He is married to Flower-Handed Widow, whom he fears and avoids. In fact, for the past five years he has been wandering on a ‘mission’ because he tired of her controlling his every move and thought. When away from her he is brave, brash and charming, but in her presence, he is most obsequious. In the presence of anyone he does not respect (especially the cowardly) he is informal and rude. He often sneaks away from his wife for extended periods. Over the past five years he has roamed the martial world taking the prettiest women he can find as his disciples. He enjoys their company and likes being seen with them but has made no advances toward any. In the past he has resided at Flower Snake villa with his wife. But this time he is determined not to return. Flower Handed-Snake is the brother of Iron-Handed Snake, Blue-Handed Snake and False-Handed Snake. He is the eldest of the brothers. Flower-Handed Snake knows Yen-Li magic and is something of an expert on ghosts, demons and spirits. He possesses the Conch Shell of Huo and has trapped a Peacock Bird Demon inside (see BIRD DEMON entry on page 359 of the WANDERING HEROES OF OGRE GATE RULEBOOK for stats on such creatures). Note: Flower-Handed Snake is secretly a member of the Southern Wind Society (see their entry in this chapter) and among them is known as Northern Dragon. The Flower-Handed Snake Maidens are all pretty women that Flower-Handed Snake has taken as his disciples. They wear green colored robes with floral patterns. They are terrified of Flower-Handed Widow and fear the day they will meet her. A righteous wanderer known for his jovial temperament, Hero Feng lies a lot and is so convincing that he often believes his own tales. People regard him as a great hero, but in truth he is a coward. He left the region ten years ago after losing a bet to Yellow Mantis. He vowed not to return for ten full years. Now he has come back in search of his love, Xing Ai (now known as Pale Fox). However he doesn’t know where she is or what name she is currently going by. Background: Ten years ago, he was planning to marry Xing Ai. At the time he was a marvelous liar who had achieved little but convinced many of his heroics. He and Ai were travelling through the southern bamboo forest and happened upon the Singing Pavilion while Yellow Mantis was enjoying some wine. Yellow Mantis had heard of Hero Feng’s exploits but did not believe in them (in part because some of the feats he claimed were Yellow Mantis’ own). He challenged Hero Feng, saying he would allow him to stay in the area if they could trade ten moves. Knowing that Yellow Mantis was a powerful man, and fearing for his own safety, Hero Feng refused. Yellow Mantis then banished him from Hai’an, saying if he ever saw him during that time he’d pluck out his eyes. Terrified, he fled as fast as he could, leaving Xing Ai behind. Hero Feng learned Kung Fu from his mother, who was a Tree-Dwelling Nun. Inspector Bing is an official appointed in Xuanlu to quietly protect the people in the River of Swarming Beggars region. He is polite, intelligent and relentless in his pursuit of justice. He doesn’t directly interfere with matters relating to the local sects but his role is to make sure that justice is served when the innocent are killed. He investigates any unexplained murders or crimes in the area. Player characters stand a good chance of running into him and if they are guilty of anything, he is likely to discover this. Inspector Bing is blind, having lost his sight in a duel with a man known as the Love Satchel King. He killed his opponent but was blinded by a sword stroke. He has an assistant named Zuan Tian (below). Zuan Tian is large and rugged looking but also highly attentive to detail. He is Inspector Bing’s assistant. Loyal he tries to protect Bing from anyone who would do him harm. He is pro-active in this respect, trailing anyone suspicious or who seems antagonistic. However, he is easily distracted by gambling, particularly Cricket Fights. Iron-Handed Snake is a cruel and determined master in his 50s. He is incredibly fit and his hair shows no sign of gray. He wears wool trousers and a cape, leaving his upper body bare. He is proud of his physique, which is exceptionally muscular. He is one of four brothers, the others being Blue-Handed Snake, False-Handed Snake and Flower-Handed Snake. Some point out that snakes don’t have hands, but Iron-Handed Snake insists that they do, even if people can’t see them. He frequently uses this banter as he strikes unexpectedly. Iron-Handed Snake is adamant in his pursuit of disciples. When he finds a skilled martial hero, he asks them to become his student. He doesn’t take no for an answer, forcing them through pain and threats of death to join him. He is selfish and only sees people as means for achieving his objectives. In rare cases he’s been known to use disciples as furniture for a full day, to test their level of respect. He claims his Kung Fu is of ancient pedigree and descended from the time of Sunan and Bao. Lovesick Lu Kang is an aristocrat whose heart was forever broken by his one true-love, Shengtong. He believes she loved him deeply. In truth she was kind to him because she needed his help acquiring the Manual of Hero Guan. Never giving him a clear answer when he asked her to marry, she allowed him to believe they would eventually marry in order to obtain his continued aid finding the manual. After she secured the Manual of Hero Guan, on the night he arranged for them to wed, she sent a note saying she had been kidnapped by an evil master named the Red Venom. However, no such person exists. In fact Shengtong wasn’t her real name either. She made it up and returned to Purple Cavern sect in the Banyan. Now Lovesick Lu Kang is on a quest to find the Red Venom and rescue Shengtong. He believes he has tracked him down to southern Hai’an and quickly mistakes people for this fictitious master. When he meets people who demonstrate good martial skill he usually assumes they are Red Venom or affiliated with him, and demand they hand over Shengtong, his one true love. He also has an enormous stash of red envelopes filled with money (99 spades in each one) and regularly asks people he meets if they attended his wedding so he can return them what he owes. He is extremely polite when making such queries. Lovesick Lu Kang wears fine red robes, like those of a groom, and is unusually tall. He isn’t skilled at travelling distance through the wilderness so he has employed a guide named Dong Zhao, who he is starting to suspect may be an agent of Red Venom. Dong Zhao is a simple man from southern Hai’an. He works for Lovesick Lu Kang but is tired of his pining. For purposes of travel, Dong Zhao has 3d10 in all subskills of Survival. Pale Fox is the leader of Pale Fox Gang. Formerly known as Xing Ai, she was heroic in her youth and the lover of Hero Feng. When Feng fled Singing Pavilion after losing a bet to Yellow Mantis, she gave up on love and put all her faith in gold, jade and emeralds. She vowed to be brave and to improve her Kung Fu so she could rise in the world. When walking through the Pale Hills, she was attacked by a group of bandits. When she killed the leader and took his spear, they accepted her as their new chief. Pale Fox values jewelry and gems, and wears them for ornamentation to reflect her rank. She prefers to fight with the Butterfly Sword, but still carries the bandit leader’s spear as a sign of her authority. She is boastful and voices her opinions freely, to the point of rudeness. However, she never says anything she believes is untrue. She refuses to hear the name Hero Feng. Anyone who speaks it in her presence, risks being struck or killed if they persist. Though her gang is on good terms with Yellow Mantis, she has personal hostility toward him. She freely expresses this, and he allows her to do so without rebuke as the two have reached mutual respect for each other due to their shared experience at Singing Pavilion. Pale Fox’s sifu was a former member of Purple Cavern sect named Yui. She never told Pale Fox where her martial arts came from. Yui died of illness 8 years ago. Note: Pale Fox is secretly a member of Southern Wind Society because she admires their leader, Southern Dragon. Among them she is known as Eastern Phoenix. Qixia is an old woman who wanders the settlements of the River of Swarming Beggars, selling skewers of candied fruit for 5 spades each. She is also a gossip, who hears news of the martial world and is willing to sell it for a price. She is a potential source of information found on the rumor table. Qixia is easily excited when she outwits people and loves to talk. Though she has excellent Kung Fu, she feigns ignorance of martial arts. Qixia is also a poisoner for-hire. While she can use her candied fruit to poison her victims, she prefers to only do this when it is a sure thing (as she doesn’t want rumors to spread about her fruit being poisoned). She has mastered a technique called Qixia’s Venomous Tongue, which allows her to excrete venom through saliva. She often uses a contact poison (Five Dragon Poison) that she can transmit to objects she knows a target will pick up, such as dice or pieces on a game board. She resides at a small home outside the city of Dee and is lovers with the leader of the Golden Heroes, Fragrant Sword.